“Horror Crash on Highway,” “Truck Crashes at Full Speed into End of Traffic Queue,” “Three Dead After Collision with Wrong-Way Truck,” “Family Crushed Between Two Trucks” – These headlines and more regularly appear in the media, with the accompanying reports telling of accidents involving commercial vehicles in which people have either been seriously injured or lost their lives. 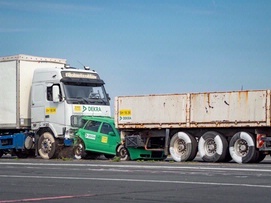 Yet however tragic such accidents might be for those involved, we should not lose sight of the fact that in relation to the amount of miles they cover, trucks are much less likely than cars to be involved in accidents involving injury. Accident figures show a fundamentally positive trend in many parts of the world – a trend that has been ongoing for many years now. This is down to a whole range of measures, including in vehicle technology – for example, the continued improvement of truck brakes. 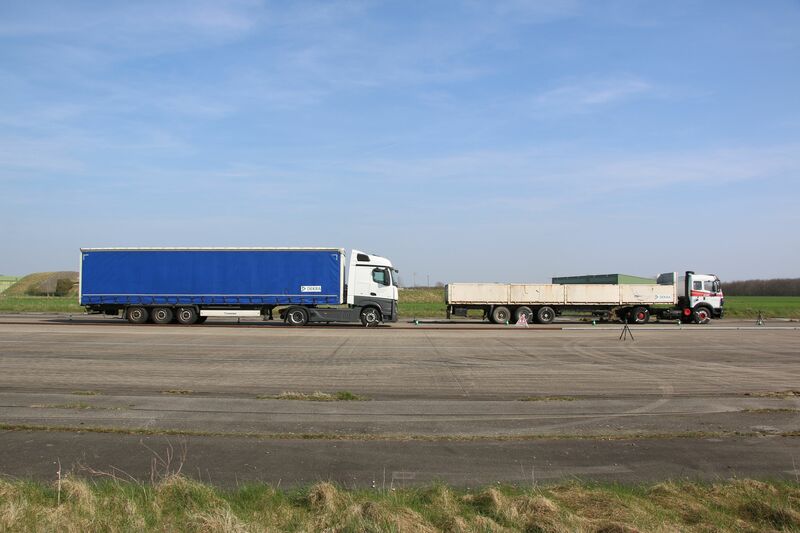 A test in which DEKRA Accident Research and the DEKRA Crash Test Center compared the brake power of a modern semi trailer truck with that of a semi-trailer truck from the 1990s also confirmed this. Both vehicles were loaded to a combination weight of 38.5 metric tons. 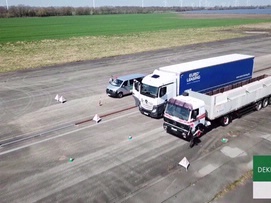 The aim of the test was to demonstrate the differences in braking distance from a speed of 80 km/h in identical environmental conditions. 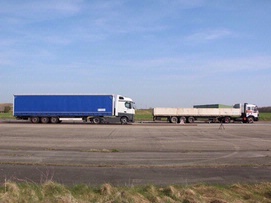 Vehicles that travel on the roads in this form were chosen for the test. 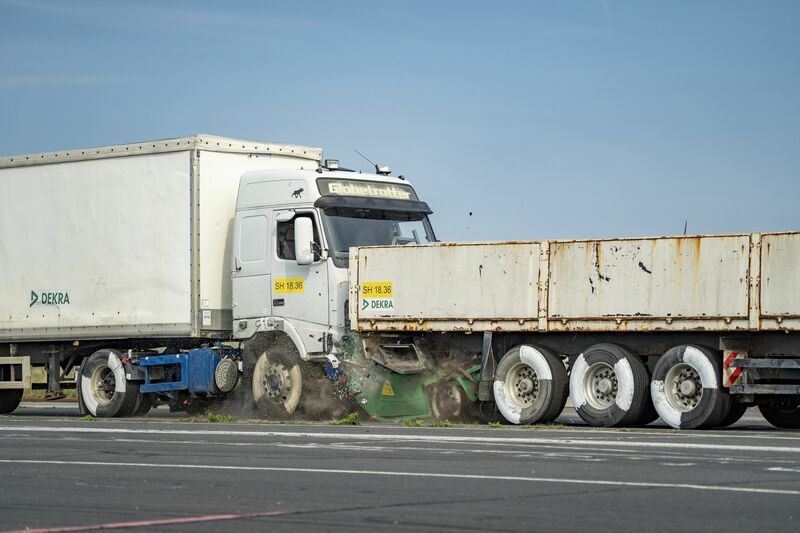 The tests showed that after full braking, the modern semi-trailer truck’s average deceleration from the moment of accelerator release to a standstill was approximately 6 m/s2. The braking distance from 80 km/h was around 41 meters. For a semi-trailer truck from 1997, average deceleration was 4.3 m/s2. 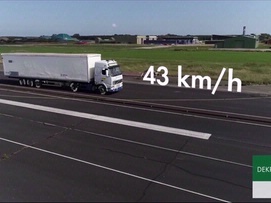 At 57 meters, the resultant braking distance was 16 meters longer. 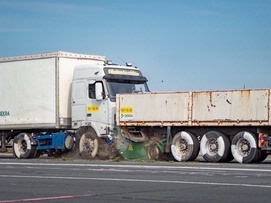 The older semi-trailer truck still had a residual speed of 43 km/h at the same point at which the newer version came to a standstill. 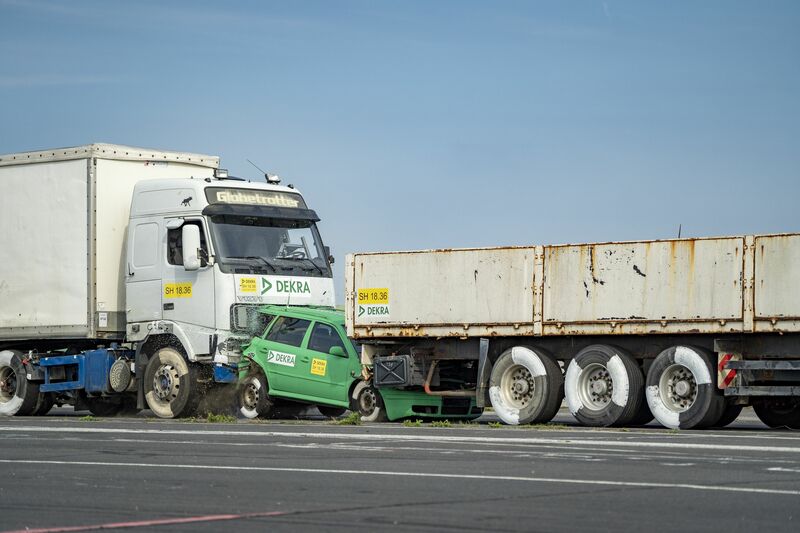 A further test by DEKRA showed just how devastating residual speed can prove when a truck collides with a stationary or slow-moving car at the end of a traffic jam. Result: the car was rammed right into the truck in front and literally crushed. In this case, the occupants of the car would have had absolutely no chance of survival.